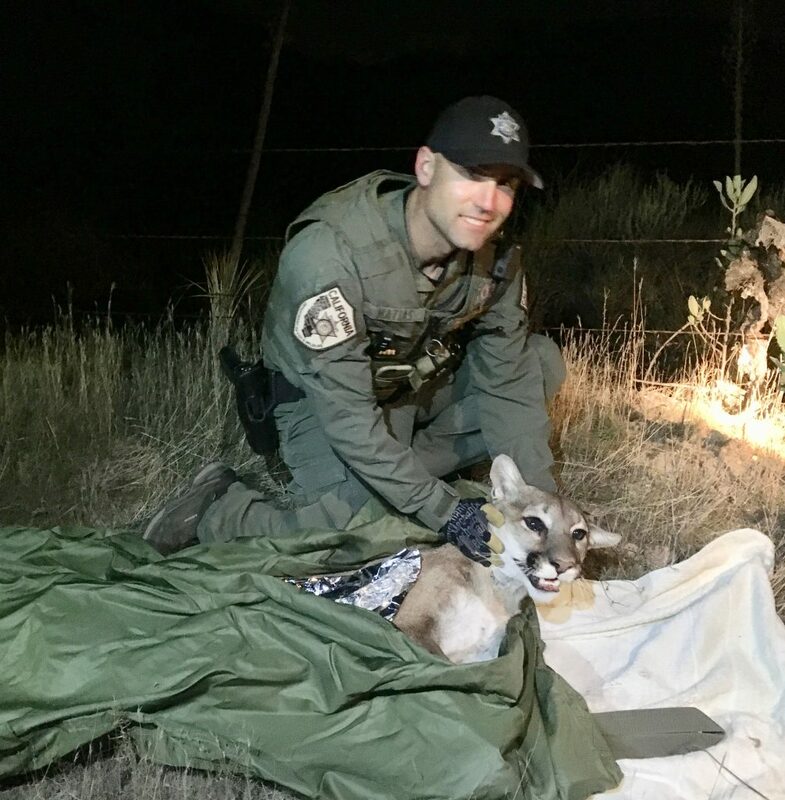 Game Warden Ben Matias with a tranquilized mountain lion. Game Warden Ben Matias, whose district covers Newport Beach, has a job that requires a specific type of person with a specific set of skills in order to protect the local wildlife on land and in the sea. And he’s just the person to do it, although many residents may not even know a game warden works in Newport. Growing up in rural Ohio, Matias learned to stalk game at an early age. He could read animal signs etched in the soil almost before he mastered his ABCs. He rendered deer before ever having unwrapped store-packaged hamburger. And he tied enticing flies to snag the area’s abundant fish for the family’s robust dinners. That took care of the protein. His mom and grandma raised all the veggies the Matiases needed to complete their vitamin-rich meals. With such a bucolic upbringing, coupled with a deep respect for the importance of wildlife, it’s no wonder Matias became a game warden with the California Department of Fish and Wildlife, after a four-year stint in the Marines and then college. 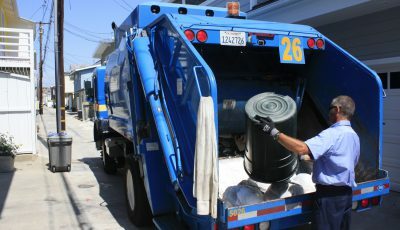 His beat, so to speak, is mostly “the aquatic environment” of coastal Newport and Newport Harbor, including the immediate coastline, and the ocean out to Catalina, as well as brush-covered state lands. In terms of wildlife and sea life protection, Matias is the one of the very few wardens on the beat in these parts. Matias admits that most people in Newport don’t know the full scope of a state game warden’s duties. In fact, he added, most people locally don’t know that game wardens even exist in the city, let alone what they do. “We’re fully sworn state peace officers, also deputized by the Federal Department of the Interior,” Matias explained. Many residents are unsure about whom to call should they witness wildlife violations, or even what a wildlife violation is, he added. They often don’t even realize the scope of wildlife in the Newport Beach area, beyond just bunnies and coyotes. A warden is a very specific law enforcement officer whose duties are seemingly as diverse as Newport’s local wild critters. In addition to chasing poachers, some of Matias’ duties include restaurant inspection, “restricted species” inspection (exotic animals requiring owner permits), federal migratory bird protection, property inspection where wildlife issues occur, hunter oversight in terms of property boundaries and rights, pollution issues and zoo inspections. Additionally, Matias can issue traffic tickets, if necessary. Newport Beach, like the rest of Orange County, is a complex mix of boundaries, with abutting districts belonging to city, county, state, water districts and private properties. In most cases, Matias works totally alone, often in areas where there is little other law enforcement support – for example, out at sea at night, solo in his outboard-powered inflatable, searching for and collaring poachers. When confronting anybody, Matias says he has to be cop, psychologist, communicator, counselor and educator. And, he has to be careful. 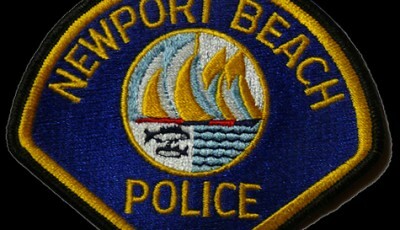 Newport Beach Police Chief Jon Lewis said the working relationship plays an important role in the coastal city. 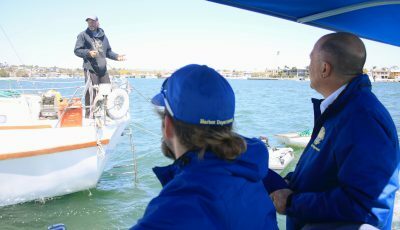 Matias offered similar praise for the Orange County Sheriff’s Department Harbor Patrol. Perhaps one of Matias’ greatest job challenges is getting court convictions for environmental crimes. Recently passed Propositions 47 and 57, which address nonviolent crime, have made it difficult to arrest people for those crimes, he explained. The impact soars well beyond obvious biological wildlife: It includes pollution that affects all wildlife along the food chain. “Trash on the ground is ocean bound,” he emphasized. That “trash” includes the types one can’t see except under a microscope or in a chemical beaker: Incredibly toxic chemicals such as carbofuran; heavy metals, including titanium, selenium and mercury; paints and oils; and countless other highly toxic substances. “This is very complex – understanding how it works – and this is why there are Fish and Game wardens knocking on the doors of many industrial businesses” upstream and away from the ocean, Matias said. His work differs from police officers in other ways as well. Where police departments are often reactive, “We are proactive – very investigative. I don’t get 9-1-1 calls,” Matias explained. In fact, his duty radio is set exclusively to a dedicated Fish and Game frequency. “When we do have an emergency, game wardens usually have to work through it by themselves,” he explained. While police assume that their contacts may be armed and dangerous, it’s common and not necessarily a threat in Matias’ line of work. “Most everyone with whom I come in contact is either a hunter or fisherman; therefore, almost everyone possesses a knife or gun,” Matias apprised. Most people with whom he interacts are law abiding, but there are a small percentage that immediately threaten, “I’m not going back to jail.” So Matias’ proactive stance immediately becomes pro-defensive. Fortunately, those interactions are rare. One of those rare encounters came six years ago, in Big Bear, when Matias became the first law enforcement officer to engage in a car-to-car, window-to-window gunfight with the infamous rogue L.A. cop named Christopher Dorner. This became one of the more high-profile exchanges in state game warden history. Aside from that rare aggressive human animal, he hasn’t been attacked by any wildlife during his career. “But you still have to be careful,” Matias added. If a wild game animal happens to attack an unfortunate citizen, Matias or his fellow wardens head to the forefront of that investigation. Attacks are rare, but usually originate from humans altering an animal’s behavior in some way. In Matias’ warden experiences, most of his rare, on-the-job injuries have come not from animal bites or humans, but from not paying attention to the trail, or falling over fences – certainly an embarrassment if he weren’t alone. Last September, while flying with the National Guard’s Counter Drug Unit, CDFW spotted a “black market marijuana grow” in Muddy Canyon. 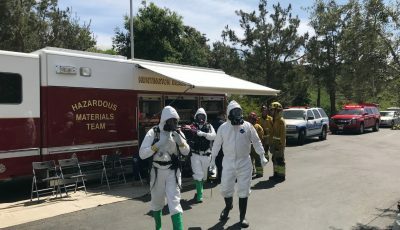 On Sept. 27, Fish and Wildlife agents accompanied the NBPD on an eradication mission, during which they eradicated 500 plants and confiscated 75 pounds of processed marijuana. When in full production, it was estimated that the “grow” consisted of almost 1,500 plants. During the eradication, Matias and his fellow officers “documented numerous environmental violations, including streambed alterations, haphazard pesticides left on the property, haphazard pesticides and trash within 150 feet of a waterway; and a poached deer.” Five growers were seen fleeing the scene, but escaped. Another example of how the various authorities work together is a recent “catch” that exposed the scope and creativity of poachers: When Newport officers recently pulled over a traffic violator, they discovered in the trunk a fishing net clogged with about 250 corbina, bass and halibut snagged from the Back Bay during a tidal flow. It didn’t take Matias long to reach the scene and to take possession of what would have become a lot of illegal gourmet dinners. “To protect and serve,” the motto printed on the side of many police vehicles nationwide, applies to Matias and his fellow wardens as well, although they often reach just a little deeper into the animal kingdom. To report any suspicious poaching or polluting issues, call the Department of Fish and Wildlife Hotline at 1-888-334-2258.